Knowledge Update for June 2011. 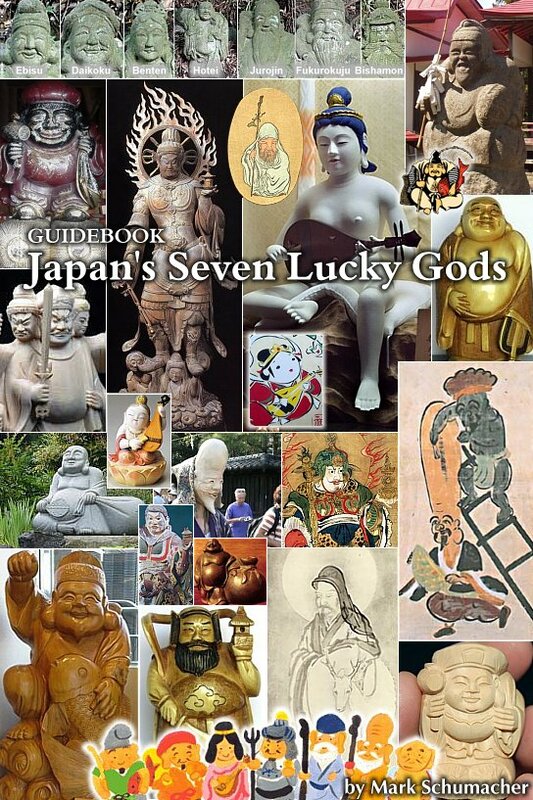 This month we turn our attention to Bishamonten 毘沙門天, one of Japan’s popular Seven Lucky Gods. This armor-clad, weapon-wielding, demon-stomping deity was introduced to Japan in the 6th century AD as one of Four Deva Kings Guarding the Four Directions. In this role, he was known as Tamonten 多聞天, the guardian of the north, treasure, and protector of the holy places where Buddha expounds the teachings. The Four Kings soon rose to great prominence in rites to safeguard the Japanese nation. In later centuries, however, Tamonten became the object of an independent cult, supplanting the other three in importance. When worshipped independently, he is called Bishamonten. Around the 15th century, he was enlisted as one of Japan’s Seven Lucky Gods owing to his association with treasure. Today, as one of the seven, he is often portrayed as friendly and jolly in contrast to his traditional appearance as a ferocious defender of Buddhist law. He is identified with various syncretic deities including Sanmen Daikokuten, Tenkawa Benzaiten, Shōgun Jizō, and Sōshin Bishamonten. Come join us for an interesting ride that starts in 6th century Japan and ends in the modern day. This story features nearly 80 “clickable” photos, copious reference notes, spellings in multiple Asian languages, and a handy guide to Bishamon’s changing iconography over the past 14 centuries. 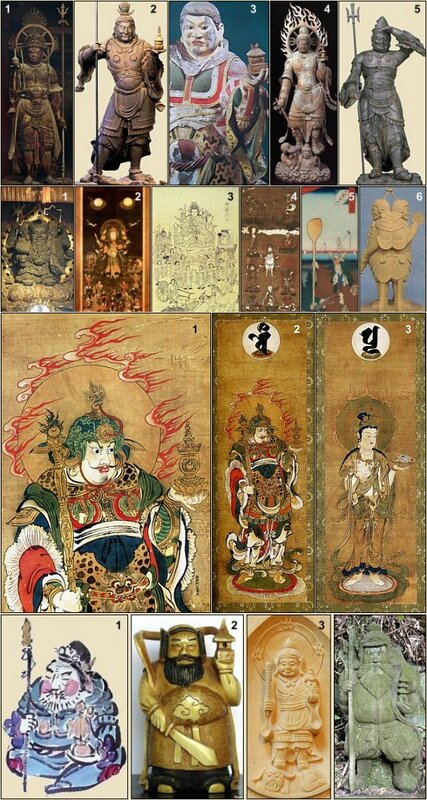 Various artwork of Bishamonten, a popular subject of painting and sculpture in Japan.